On Thursday we decided to finally hunt the towers. Two in our party went over to the next ridge west from the tower ridge. Two went to the bowl, and I went to the top. We got in early and I was up to Dalton's rock before 7 am. 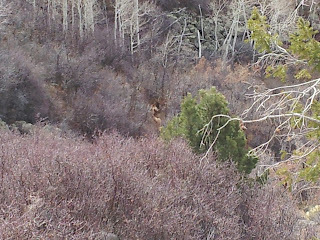 As I scoped the mountain side from the next rock on the ridge, I spotted a bull elk high above and to the right of the mudslide. I devised a plan. I would make my way through the oak brush at the lower end of the slide, then sneak up the soft mud to avoid detection. My plan was working out perfectly as I detangled my way to the bottom of the mud slide. The side ridge of the slide made a perfect visual barrier and the soft dirt was very quiet. 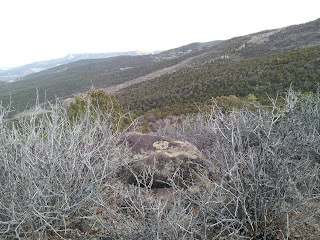 I poked my head above the ridge about half way up, but couldn't see the elk. 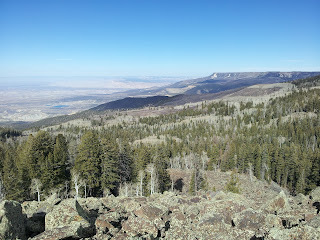 I proceeded on to the next chosen vantage point, but again no elk. I was beginning to think the bull elk I had seen from far below was in reality just a boulder or something. 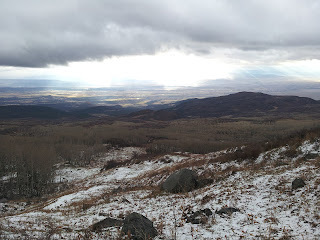 As I made my way on up, peaking over the ridge, I finally came to the full view. Two spike elk! They were bedded down in a small opening just 30 yards away. They had no idea I was there. Man, did I wish one of them would grow some bigger antlers! I scoped each of them with my rifle, and watched them with my binoculars for over a half hour. They were very on edge, perking their ears and nose to every little change in the breeze. Finally, I decided to move on. Although quiet, when I did stand up, they immediately detected my presence and spooked. They crashed through the thick oak brush and seemed to have some difficulty making their way through. It was good to see it isn't always humans that find this stuff annoying. I made my way to the top of the mudslide and to the spot I had shot at the bull a few years back. 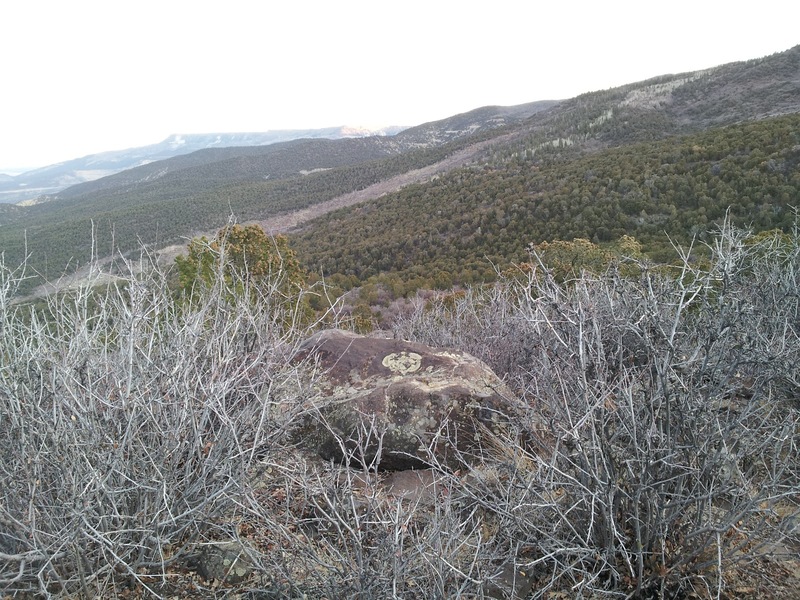 The only way through the thick brush and back to the ridge, was up over the top of Indian Point. I finally bagged this sucker after many years of hunting around it. Nice view. On Friday, my last day of the hunt, we finally got snow. I decided to hunt the middle section of the Blue Grouse Trail. I started up through the meadows about a half mile past the Point Camp Trail hoping to make my way up to the dark timber pockets below the rim. 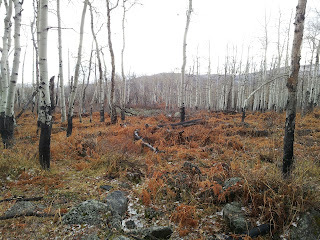 As I rounded a large bend in the path, I spotted two cow elk. As I readied myself for the first shots of the season, I spotted a nice bull. Probably a five point, so I knelt down and tried to steady my aim. I let the lead fly, but missed! Another shot and another miss just low! Damn. Now the elk aren't hanging around any longer and they take off up hill. 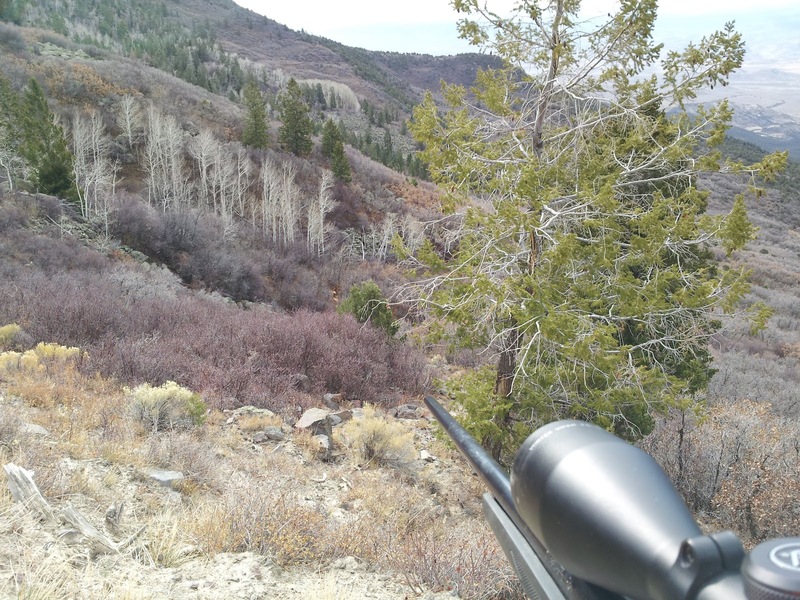 I tracked these elk all the way to the top of the mountain through some steep side hills and a lot of thick timber. Even though it was snowing on and off all day, at times it was hard to find tracks. At one point I had to back track and get my forgotten fanny pack. 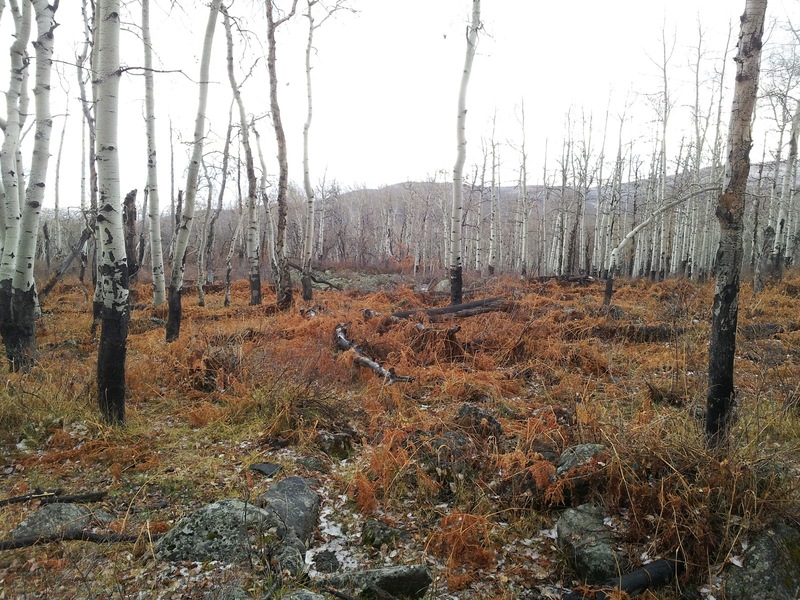 They led me through the timber and finally into the upper rolling meadows of aspen groves. Finally at midday the tracks became too hard to follow. I never seen the elk again. I promised myself I would practice shooting my rifle at longer distances: 200-300 yards, at least once per month for the next year. I can't miss another shot like that again. They are too few and the hard hiking it takes makes it silly not to be able to finish. I want you dear reader to keep me honest in this pledge.